Guys, I have a shameful confession to make: when I visited London for the first time a few years ago, I completely neglected the food scene. In a desperate attempt to save money, I basically lived off of cheap supermarket sandwiches and salads. Who goes to the foodie paradise that is London to eat pre-packaged Tesco sandwiches?! Blasphemy! I must have had a momentary lapse in sanity because finding good food is normally my number one priority when travelling, and yet for some reason that I cannot comprehend, I completely overlooked it altogether. For my second visit to London, I was on a foodie mission, and I was hell-bent on eating as much as possible. After reading loads of blog post and articles, I had penned a lengthy list of restaurants and markets to try. With only a short amount of time in the city, my four days were planned solely around food. Apart from a handful of restaurants, majority of the dishes I wanted to try were from food markets. Normally I find myself overwhelmed with choice, and since I was determined to try the best meals these markets had to offer, I decided to scour Instagram for anything remotely delicious-looking in order to help narrow down my options. Being an Instagram creeper paid off big time because some of the best meals I had in London were ones I discovered on strangers’ accounts. When I searched #BoroughMarket on Instagram, photos from two stalls dominated the feed: Kappacasein and Bread Ahead. Kappacasein offers a raclette or a cheese toastie, and deciding between the two dishes was one of the most difficult decisions I’ve made in a long time. I ultimately chose the cheese toastie and it was, quite possibly, the best grilled cheese sandwich I’ve ever had. With three types of cheese – cheddar, comté, and ogleshield – mixed with white and red onions, leek, and garlic served on two slices of sourdough bread – it certainly isn’t your average run-of-the-mill grilled cheese. For a relatively simple sandwich, the textures and flavours were complex and varied: rich, salty cheese perfectly complemented the ever-so-slightly sweet onion and crunchy leek, and the thick, gooey filling was nicely balanced by the crisp sourdough bread. Bread Ahead Bakery is best known for its sourdough loaves, but their doughnuts have quite a following as well. I honestly don’t even like doughnuts, but the unique and gourmet flavours piqued my interest. Velvet chocolate, hazelnut and almond praline, and blueberry custard were a few flavours on offer when I visited, but I couldn’t resist the crème caramel and salted honeycomb. 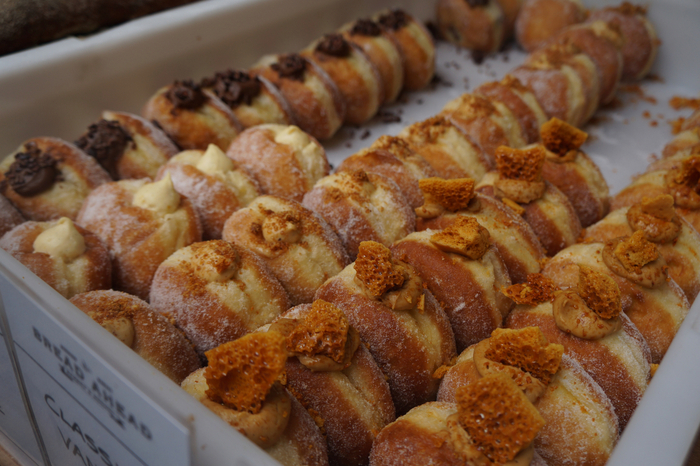 This doughnut was just ridiculous; the dough was soft and pillowy, the filling was light and creamy with a subtle caramel flavour, and oh, did I mention the chunks of salted honeycomb? Two other things I loved about this doughnut: it wasn’t overly sweet and the filling-to-dough ratio was out of control. Khanom Krok serves authentic Thai street food dishes: quail eggs, mango sticky rice, and pad thai – to name a few. I made a beeline for their signature dish – khanom krok, or coconut pancakes. Using traditional dimpled pans, a rice flour and coconut milk concoction is topped with a sprinkle of sesame seeds and cooked until slightly crispy around the edges. They may look plain and simple, but make no mistake, these little morsels were incredibly flavourful and delicious. The crispy exterior had a crepe-like texture and the centre tasted like a sweet and creamy coconut custard, with an added pop of flavour from the sesame seeds. One order includes 8 pancakes, but I was this close to buying a second order immediately after finishing my last pancake. Located only steps away from Brick Lane, this historic Victorian market hall has been in operation since 1876. The market is open everyday, with a rotating theme – like antiques, fashion, or art – dependent on the day of the week. While not primarily a food market, Old Spitalfields does offer a selection of restaurants, kiosks, and food trucks. The notorious Bleecker Street Burger is located here, and Sud Italia was serving wood-fired Neapolitan pizza when I visited. I was searching for a quick breakfast dish, and grabbed a smoked salmon and cream cheese bagel from a nondescript kiosk with an assortment of heavenly-looking baked goods. Maltby Market is slightly hidden: set among the railway arches along an alleyway near Bermondsey Street, it’s essentially the antithesis of Borough Market. It’s charming and intimate, with pop-up cocktail bars and antique shops, and locals outnumber tourists. Here you’ll find some of London’s best food and drink purveyors, including St. John Bakery, Neal’s Yard Dairy, and Little Bird Gin. Walking amongst the stalls, I noticed high-quality, gourmet offerings seemed to be the theme of this market. Handmade chocolate truffles, fresh oysters, traditional French pastries, and lobster rolls were only a few of many decadent items I spotted. I wanted to eat just about everything at this market, but the main reason for my visit was to try WaffleOn. Another fantastic Instagram discovery, WaffleOn serves buttermilk waffles with a unique combination of toppings that you’d likely see on the menu of a fine dining restaurant, like slow roasted duck with fresh plum sauce and biodynamic egg. I’m a bit of a goat cheese fanatic, so I immediately ordered the goat cheese waffle without even so much as a glance at the other options. Grilled goat cheese with a blueberry coulis, honey, fresh figs, and blueberries topped the warm, chewy waffle, and it made for a mouth-watering combination. In terms of atmosphere, Broadway Market was definitely my favourite. It was fairly packed when I arrived on a Saturday afternoon, but it still had a small-town market vibe, with live music and friendly vendors to boot. There was a diverse array of international cuisine, traditional British classics, and fresh local produce. With so many options, I struggled to decide what to choose – until I spotted Hanoi Kitchen. As a self-professed Vietnamese food addict, I couldn’t resist their rice noodle pot. Vermicelli noodles with pickled carrots, lettuce, coriander, mint, Thai basil, peanuts and crispy shallots served with spicy tofu or pulled pork and nuoc cham. It was savoury, sweet, and spicy, with an added crunch from the peanuts and shallots. The nuoc cham was incredibly tasty, and it took all my will power not to drink the remaining bit of sauce from bottom of the container after I had finished the noodles. I was getting full at this point, but couldn’t possibly leave after only trying one dish, so I grabbed a few small things to go: a mascarpone, tomato, and pesto tart from Artisan Foods and coconut and dark chocolate bounty bites (which were basically a healthy version of a Bounty Bar) from Eat’n’mess. Located less than a five-minute walk from Broadway Market is the quirky and hipstery Netil Market. Although on the small side, Netil offers an impressive selection of food vendors, vintage clothing and jewellery stalls, and even a barbershop. I was dying to try Bao London, but much to my dismay, they were closed when I arrived. Apparently they recently opened a shop in Soho, and their Netil Market stall is closed temporarily. I cried a little inside, and then made my way back to Broadway Market to hunt for something to satiate my steamed bun craving. I seriously contemplated trying pizza from Made of Dough, but since I had been eating all day and wasn’t physically able to finish a full pizza, I opted for something healthy instead. Benny Buttons Organic Coconut Tea sells hot and cold coconut water-based beverages, with added ingredients like green tea, ginger, and blackcurrant. Even though I hadn’t been drinking the night prior, I opted for the ‘hangover cure’ which consists of fresh coconut water, organic lemon, apple cider vinegar, cayenne pepper, honey, ginger, and cinnamon brewed together and served as a tea. While steep at £5, it was refreshing, and helped to soothe my stomach after four days of binge eating. Despite my best efforts, I still have a long list of foods I want to try in London. There are approximately a thousand more dishes I’d like to sample from the markets, and so many more from the endless amount of pop-up food venues across the city, like Kerb and Urban Food Fest. You could literally spend every hour of every day in London eating and still manage to find another delectable, unique, and varied dish to try – and that’s exactly why I love this city so much. What’s your favourite foodie destination? Which London food market do you think is best? You had me at cheese toastie! Oh my gosh, this food looks amazing. I would have totally planned my trip around food too 😉 I have heard really good things about London’s food scene lately. It’s too bad I wasn’t aware of it when I visited. One of my favorite things to do when I travel is to find wonderful and delicious food with my friends! 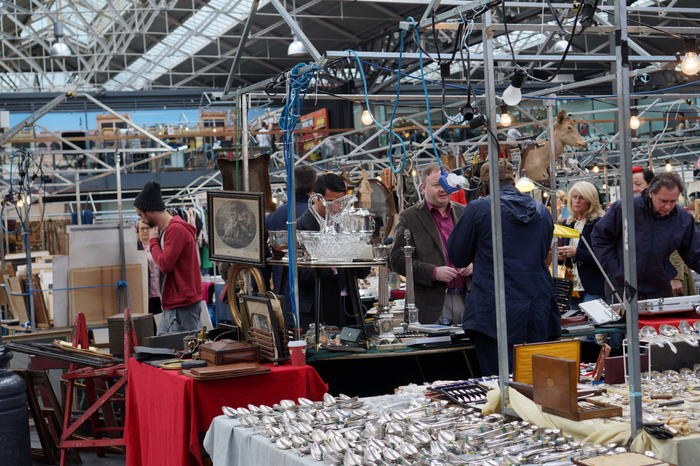 It really looks like you had a lovely time exploring London’s Markets! I’ll definitely have to remember Maltby Street Market! I love exploring antique stores and having a diverse selection of food options! London’s markets are amazing, and there are still so many more I’d like to visit! Maltby is a gem – I’m sure you would love it! I’m looking forward to the day I’ll be able to explore them! 🙂 Thank you for introducing them to me! All of this looks amazing. I’m tempted to buy a plane ticket to London right now, just to eat. I live in London and am totally obsessed with the markets. I’m glad you agree on one of my favourites (Broadway). I also recently discovered Netil market. Seriously – I cannot get enough! Next time you’re heading over let me know – there are new places cropping up all the time (like a new small market behind King’s Cross most recently) that are totally amazing. I was seriously contemplating moving to London for a bit because the markets are so amazing! I just read your post on Exmouth Market, which also sounds fantastic. I will let you know when I’m in London next – it sounds like you have some good suggestions for me! Well, by being so fastidious with your choices, you’ve given me some fantastic options for when I visit London (and check out the food scene, no matter how low on cash I am by that point!) Cheers. I used to live close to London Bridge, and would often get off the underground so I could make a detour to Borough Market mmmmmm before going back to my place. Another is Greenwich Market which has a tasty variety of stalls. It’s doubly great because you can then stroll to Greenwich Park and have a picnic. Ahhh I miss London so much! I don’t think I’d be able to control myself if I lived near Borough Market! Greenwich Market sounds lovely as well. There are so many amazing markets in London – I can’t keep track! This all looks surprisingly good! I never really liked the food in/around London so maybe I’ll have to try out some of things you’ve been suggesting! I used to work at Borough Market- so proud! I think I gained 10 pounds that summer. Camden Market also has great international food. I don’t know how you managed to work at Borough Market.. I would literally be eating non-stop if I worked there! I’ve heard great things about the food at Camden Market as well – I’ll have to head there next time I’m in London! I lived in London for 9 years and I didn’t go to some of those! Whyyy? Brixton Covered Market is another good one. I love the way you did your research on Instagram – very strategic! I LOVE the amount of thought and planning that went into this that is based around food. Good call on searching through Instagram. My first time in London will be next year, and now I have an excellent reference point in this post in terms of where to eat. Everything in here looks so tasty! I’m glad you can appreciate my food planning 🙂 Luckily you’ve got plenty of time to search for good places to eat during your visit – there are so many options!